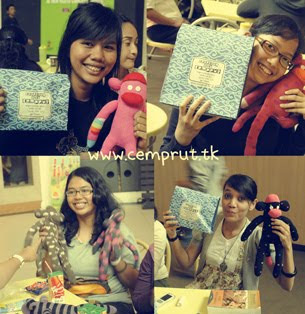 c e m p r u t: the report: Crafting With Cemprut...!!! this day is a very fun day... today is my 26th birthday and cemprut 2nd birthday. 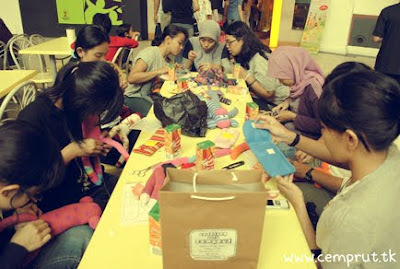 i would report my "Crafting With Cemprut" this morning, it was very fun, meeting a new girl friends that i never met yet (exept Arrie), and have a nice chit chat, thru the crazy stressfull time and ended with a wide happy smile. oooh...almost forgot, thank for all of you who's give me a happy birthday wishes :) big huuuggg and kiiissss for all of ya... :) and the special thank's is for my handsome man Ay for making this all comes true...kiss kiss... and all pic taken by Ay. HAPPY BIRTHDAY! Seems that you have had a really great time! Your creations look lovely! i wish I could have joined to that! bahagia selalu ya nooon!!! cihuuuuyy!! I had a very great and fun times with you all!!! Thank you for patiently teaching us :). I love my monkey so muchhhh..
What lucky girls!!!! I would have liked to be one of them!!! Aarrgh, so envy, I couldn't come!